Here’s a word that was used on a website I visited this last week. And what it means? Check out Webster’s by this link. I wish we still used cool words like this. Time to start reading the dictionary again… for fun! Mother and I visited theTacoma Art Museum today. We went primarily to visit the lovely quilts by the ladies of the Gee’s Bend Quilters Collective. We got lucky and were able to speak with Loretta Bennett, one of the quilters. She is only a few years older than I am, and her quilts (she is prolific) are amazing. Like Frank Lloyd Wright stained glass windows… I noticed several other ladies there, they were all so kind and happy to talk to the people who were looking at their quilts. Of course, not all the quilts appealed to me equally. Some I liked for the colors. Some for the patterns. Some I admired for the technical skill displayed though the actual quilt was not something I particularly liked. Some were just really really amazingly cool. (Can you tell I liked them?) I appreciated them all. Now quilts, like most things we now collect, started out as something utilitarian. In this case, something to keep the cold at bay. Like the people in my mother-in-law’s family for generations, the people of Gee’s Bend lived a rural, relatively low-income life for many generations. They used their resources wisely… and part of that is taking pride in your work. Making something utilitarian is the starting point. The pride comes in when you make it well, either by making it function better than the minimal, or by making it beautiful. Like the women in my mother-in-law’s family, the women of Gee’s Bend showed their pride by taking scrap fabrics (often pre-used) and making beautiful – and warm – quilts. The history of Gee’s Bend starts before slavery ended, and the quilting can be traced back to one particular former slave, ancestress of Ms. Bennett (and many others). Left somewhat isolated by the end of the 1800s, the women of the town, seemingly all related by blood or marriage, carried on the tradition of making quilts to keep their families warm. Eventually, one lady (I forget who) formed a quilter’s collective. They have been working together to make quilts for over 50 years. Some of the women who made these quilts are way up in their 80s and 90s. One quilt displayed was by a woman who lived 103 years. Events like this quilt exhibit make me hopeful for humanity. We can live in difficult — inhuman — situations, and still we can make beautiful things for those we love. We can do something, even if it’s small, to improve our lot, or the lot of those around us. Rather than sitting in their town stuck in poverty, the women through the generations have worked to improve their families’ lives. And though it took a while for outsiders to find them and begin to send money in to the community (they actually made quilt tops and pillow shams for Sears in the 1970s! )… it happened, not because they were aggressively self-marketing, but because their work was perfectly wonderful. If these quilts come to a museum near you, please attend. Even if you don’t ordinarily like fabric arts, check this one out. The design and variations on themes are magnificent and beautiful. The ladies are even more so. We also visited the Washington State History Museum, but instead of going to see the temporary exhibit on quilts, we spent an hour in the Native American section, and I told Mother all about the things I am learning about the Squaxin Island history and art. Many similarities in materials, design and history with the tribes who are represented at the state museum. Then we had lunch at TwoKoi, a Japanese/Sushi restaurant across the street (uphill) from the Tacoma Art Museum. They are celebrating their first anniversary this weekend. I had not eaten there before. I found the service slow but friendly… the food was excellent. Not a budget restaurant, but reasonably priced if you want something a bit nicer than a sandwich shop. I didn’t have sushi this time, but the Unagi Don (broiled eel on rice) was excellent, as were the miso soup and seaweed salad. The tea, a light corn tea, was the perfect foil. I think it was just about the perfect day. This time, Marcel Marceau: talented, brave and caring, he made a difference in so many lives. I feel very good about my activities the last couple weeks. 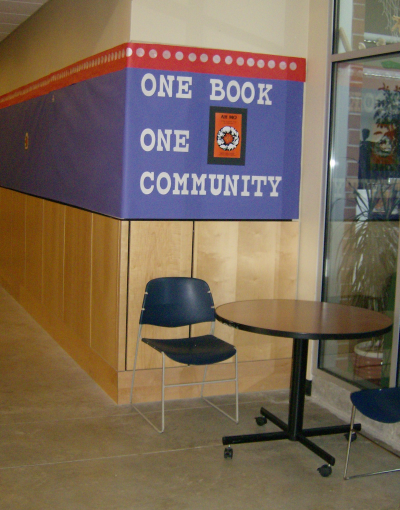 I researched and designed a bulletin board for the local school which is going to do a “One Book One Community” project on the AH MO book, a collection of stories recorded by Judge Arthur E. Griffin (died 1947) and edited by his great-grandson, Trenholme Griffin. The school and the local tribe are collaborating to provide the children of our community a very real gift: the gift of knowing the history of place. Children who are tribal members will see their own history reflected in the school this year, the way that I, growing up in Virginia, saw mine [ only as an adult did I learn I had ancestors who walked the streets of historic cities before, during and after the formation of my country]. Children who descend from the first European and American settlers may have a greater appreciation for the challenges their forebearers faced. And children who are more recent transplants will have a handle on the culture and lifestyles of the people who were here long ago. I am also helping pull together a pamphlet/flyer; coordinating and inviting some of the people who will be involved; and may end up teaching an art class (this would be fun for me, if work) later in the year for children after school. We’ll see about that last… I might enlist a friend who is a certified teacher to lend that idea some merit in the eyes of the decision-makers. Today I got the last of the bulletin board ready to go, and printed out the first draft of the flyer. I am doing good work in Mother’s classroom also. Her children this year are a delightful group… if only there weren’t 26 of them! Still, with two of us there the kids are getting enough time and monitoring — already they are beginning to settle in. I know that as the year progresses the routines will be familiar enough that I won’t be needed, but I also know that every moment these kids spend with a caring, safe adult is a gift — and every small thing that is caught because there is an extra set of eyes in that room will help. Though I don’t want to be a teacher, I really think I want to consider working in the schools full-time at some point. And I really see in action the effect that over-full classes can have, and how the presence of just one extra adult can mitigate some of that. Well, with all my “doings” I am seeing a trend, one which I had predicted: Yes, I can work outside the home and be reliable and productive! No, I can’t seem to get anything else done on the days I am promised away from home. The boxes in the office still need sorting. The mail and papers are piling up on my desk because I don’t have the energy to decide where they belong. The yard is even less kempt than before. The days I don’t “work” I spend a lot of time napping. And I am feeling good about it. The boys and Tom are picking up the pieces that are important. The other pieces can rest and wait. As my body adjusts to the new schedule I may begin to have more energy when I am at home. Or not. Either way, we will have more data to evaluate how I should go about achieving what I want within the context of being part of the family. Hoping all your endeavors will be succesful! This little robot is the brainchild of a Japanese cognitive scientist. It is cute, and is becoming a bit of a YouTube sensation. I rather like him… and this video shows the effect Keepon has on people. What do you think? For a little more information, check out Dr. Kozima’s own page. Now, I have friends and relatives who are in the medical field… I KNOW that there are many panicky parents who don’t know what they are talking about when it comes to their children’s health. I also know that parents are often the first to pick up on something being not quite right. Why, when a parent calls and says their child has chickenpox, would a doctor dismiss the parent’s opinion (and concerns) and not even want to see the child? And not offer any explanation for what else it could be? Fever of 39 (that’s 101-102 fahrenheit) for nearly a week, an itchy, blistery rash that is spread over head, scalp and torso (but not on the extremities) that resolves within a day or two to a scab. Not a lot of actual spots, but what there are, are very obvious. No other symptoms other than a slight headache the day before the spots appeared. My concern is, assuming I was correct the first time he had chicken pox (it looked and acted just like this) then this is its evil twin if it isn’t chickenpox! And if it is chickenpox, does that mean my child will always catch it? My other reason for believing this is chickenpox is that I catch every virus the kids bring home. Every one. But not chickenpox, which I had as a child (I was very very sick with it, too)… to which I am immune. And I am not sick! After two weeks working around germy first graders, I am not ill… while my generally healthy kid is. So, I took some pictures, which I will print up and take with me to the doctor when our usual physician returns from a vacation next month. And we will see if we can find out if he is in fact immune to chickenpox. There is hope. For Youssif, and for all of us. The most recent CNN story (12 Aug 2007) is at Youssif and Family Arrive in U.S.. Previous posts are at this link and this one. Remember too, there are thousands of other burn victims around the world who need support, financial and time-wise. Contact your local burn center if you are interested in helping. And of course, a permanent need is always blood supplies for people who are in accidents or who require emergency surgery. If you are eligible to donate, please do. Your local Red Cross can direct you to the closest donation unit.